From June 22 through June 24, 2018, there were 18 commercial Chapter 11 cases filed in the United States. The Petitions were filed in NJ, NC, VA, CA, FL, PA, UT, TX, NY, IL, NM and MS. The cases were in the trucking, IT, retail, oil/gas, entertainment, real estate, restaurant, automobile, health and construction industries. 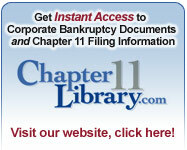 Our cost-effective list includes Chapter 11 cases from all industries. Sign up for a free trial now.